"There once was a hidden, government research facility that housed many paranormal and unusual items, away from prying eyes. That was until someone stole all of their stuff and firebombed the facility." 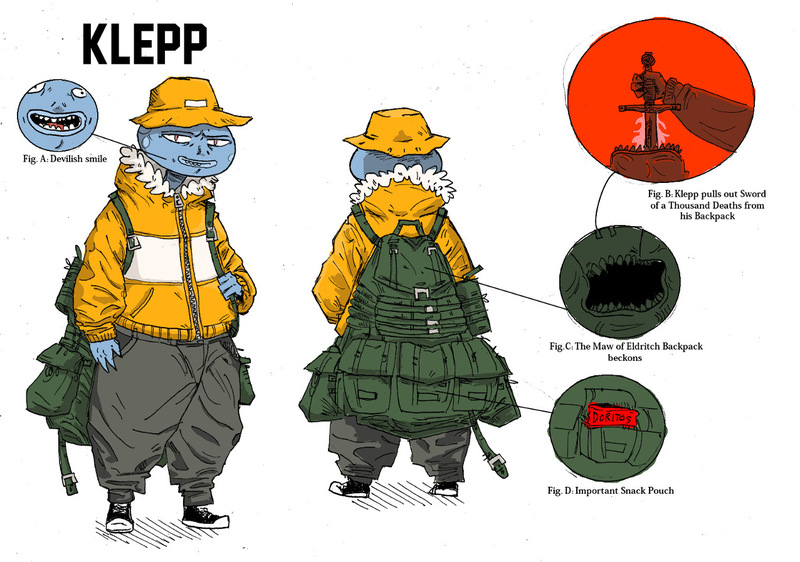 Now Klepp, a laid back but determined soul, is traveling anywhere he can, trying to discover more interesting items to amass his collection. He stores his loot inside his eldritch backpack, which has a seemingly infinite amount of storage space. However, despite having an encyclopedic knowledge of the items he possesses, he skimps on organization, so he's never really sure what he's gonna pull out. Even with his arsenal of magical items behind him, Klepp prefers to solve situations peacefully, but he'll protect himself and his stuff if threatened, and with so much devastation at his fingertips he can be a formidable opponent. Also, Klepp likes Jazz, Thai food, and Akira Kurosawa films. Ever since Klepp's arrival in Void city, he has been living on the streets. He had a small stint as a pizza deliveryman but was unfortunately fired. Now, he survives under awnings and in alleyways, trying to survive whilst battling his obsession with collecting.